Charlie Case steered Breaking The Bank to a hat-trick of wins following Sunday’s success at Whitfield. 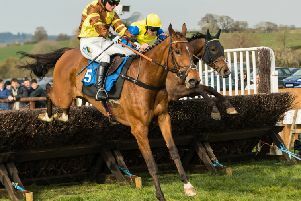 It came in Sunday’s Grafton Hunt point-to-point meeting at Whitfield where Breaking The Bank survived a blunder before completing a hat-trick in the Five-Year-Olds And Over PPORA Club Members Race for novice riders. The teenager shot up the neck of the eight-year-old, trained by his mother, Sarah Case, at Edgcote, following the mistake at the 12th fence, before getting his mount back on an even keel and going on to hold off Billy Biscuit by half a length. To add to a special day, his grandmother, Amanda Case, was present. But there was controversy after Jonjoela was disqualified from first place in the Restricted Race with the prize awarded to Ballyfore Cross. Andrew Pennock’s six-year-old mare, ridden by Evan David, jumped across Ballyfore Cross at the last fence. Katy Lyons’s mount, owned and trained by Tim Underwood, rallied and appeared to take the lead on the run-in only for David to get Jonjoela up in the final strides and win by a head. The placings were reversed following a stewards’ enquiry, with the officials ruling that although they deemed the interference at the last was accidental, as there was only a head between the pair at the line it had affected the result. Sussex owner-trainer Georgie Howell admitted Always A Chance had exceeded all expectations after the ten-year-old got up close home to take the Ladies’ Open under an inspired ride from her daughter, Tabitha Worsley. It was a real family affair in the Grafton Hunt Members, Subscribers & Farmers Race, with Aunty Joan, from Richard Pringeur’s Greens Norton yard, completing a hat-trick of wins over her full brother, Midnight Monkey. The Midnight Legend siblings were bred by Sylvia Busby, from Weston, near Brackley, who owns the James Martin-ridden winner with her husband, John. Barbury Castle trainer Laura Thomas believes Very Intense can go on to better things after the six-year-old won the Intermediate Race. Moorland Sunset won the Ten-Year-Olds And Over PPORA Club Members Conditions Race under Peter Mason. Charlie Davies partnered Wild Ginger to win the Open Maiden, going one better after being second on his last three starts.